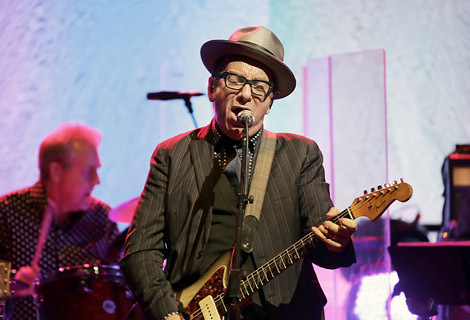 Elvis Costello returns to Liverpool with his Spectacular Spinning Songbook, Getintothis’ Alan O’Hare revels in two and a half hours of emotive spiky soul. It’s not just the Stones who keep on rolling. The first generation of rock n’ roll may tour the world’s stadia every 18 months and rake in the big bucks for the big shows. But the generation who came next, those spiky souls who are boxed forever as punk and new wave, aren’t doing bad either. And Elvis Costello is out in front. The great thing about a songwriter continuing to release records and tour is that the live show, like any great production, develops a third act. Sure, we get the hits, misses and maybes – but there is also something tangible hanging in the air capable of turning good nights into great ones. Perhaps it’s just a solid bond between performer and punter… whatever it is, it existed in the Philharmonic Hall on Hope Street last night. 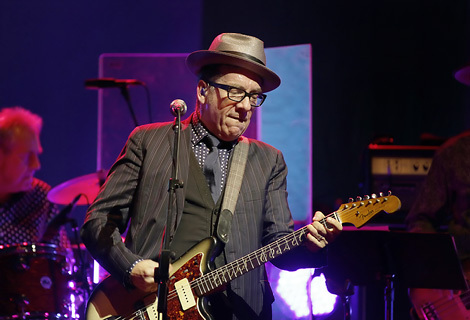 Costello – and his band The Imposters (just an original bass player short of The Attractions) – once again brought his ‘Spectacular Spinning Songbook‘ to town and managed to match last year’s contender for gig of the year at the Liverpool Empire. The sound was certainly better. Steve Nieve‘s delicious organ washed around the hall, creating space and colour, as Costello bashed away on vicious sounding electric and acoustic guitars. The band, including long-time EC drummer Pete Thomas, sounding fantastic and the songs fizzed by with real urgency. Tempos were fast and the set list even faster, as The Imposters tore into Lipstick Vogue, (I Don’t Want To Go To) Chelsea, This Year’s Girl and I Wanna’ Be Loved right from the start. The first spin of the big wheel – the set is punctuated by audience members being invited on stage to tell Costello their favourites in the hope the wheel lands on one – brings a gorgeous take on A Good Year For The Roses, before a succession of female guests request the ubiquitous She, until Costello finally relents and that reverb-drenched voice serenades the rapt crowd, sat in hushed awe, with the Charles Aznavour standard. 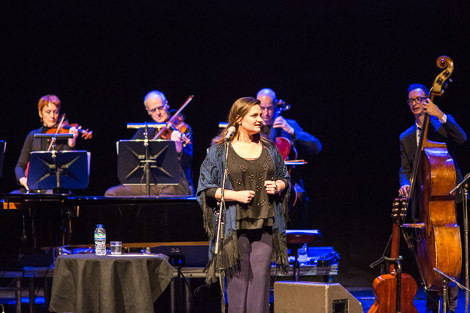 The piano melodies continue with a jazz-tinged Almost Blue (during which Costello ascends to the upper section of the hall to sing), a grand All Grown Up and a beguiling version of Shipbuilding – “diving for dear life” almost opposite the shipyard that brought the lyrics to the former Wirral-dwelling writer. It was some moment… and they kept coming. There was certainly something in the air when Elvis introduced Tramp The Dirt Down with a touching nod to his late grandmother Mabel’s battle with demetia. “I wouldn’t wish that on my worst enemy,” he revealed, before playing the song that baited Margaret Thatcher and her policies a very long time before it became fashionable. The song was delivered with grace, style and a nod to the fact that, while those policies are still in full effect, a great song will always live longer that the rest of us. At the end of it all, after rapid fire deliveries of Oliver’s Army and a trio of new (ish) finger pickers – make sure you check out the wonderful Jimmie Standing In The Rain – the audience was exhausted: two and a half hours of emotional delivery will do that to you. Perhaps that’s where said third act comes from: leaving your paying punters with everything. After all, the best thing an artist can give an audience is himself. And what’s so funny about that?